The data are in! 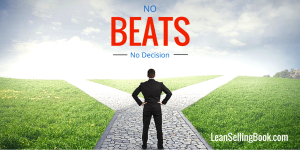 A recent post I ran in the LinkedIn group, Sales / Marketing Executives (CSO/CMO), asked whether a “no” decision (from a sales prospect) was better than “no decision.” The respondents to this question preferred a “no” decision by more than a 10-to-1 margin! A common theme across the responses was concern with preserving salespeople’s (precious) time rather than investing additional time in trying to save a deal. This is a practical response, as salespeople’s time is a limited resource and it makes sense to redeploy that resource—as early in the sales cycle as possible—toward opportunities that are more likely to close. The best favor a buyer can do for a seller is to reveal that he or she will never, ever—under any circumstance—buy anything from the seller or his or her company. How is that a favor? Because with that knowledge, sellers can stop wasting their time—and their company’s money—when they invest in a buyer that is never going to buy from them. How often does a buyer communicate these sentiments to a seller with such candor? Almost never—unless a seller manages to so thoroughly aggravate or so rudely personally insult their buyer that they never want to see that seller again. It’s too bad we can’t get buyers to be more honest with us without making them our enemies. How can we get buyers to tell us when we are wasting our time—and theirs? This is the question sellers should be asking if they want to improve their productivity and invest more of their time in closing the most promising opportunities. Or possibly, it’s not the right question, because it is based on is faulty premise! What if buyers who will never buy from us have been perfectly honest with us all along? Is that a possibility? Could it be that we sellers don’t ask the right questions of buyers to lead them to giving us a straight and truthful answer? Might it be that buyers don’t even consciously know that they won’t or can’t buy from us? The truth may be locked up in a deeper, less conscious nook in the buyer’s psyche. 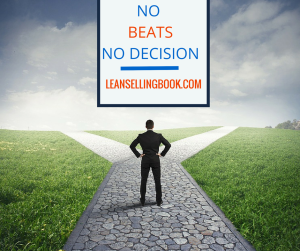 Never take this indecisive behavior of buyers personally. It likely has nothing to do with you or your company’s performance, products, or services. It’s just that the buyer can’t buy from you for reasons that neither you nor the buyer fully understand or can articulate. But in the end they still will not buy from you. In fact, they may not buy from anyone. Can you see how knowing that fact sooner rather than later is a great advantage for you as a seller? But how can you get to the truth? You can only hope to gain this knowledge by understanding—in many cases before the buyer does—what the buyer really requires to make a decision to buy—something, anything, from anyone. If you can figure out what the buyer requires to buy specifically what you are providing, that’s even better. This journey of discovery with the buyer is going to require seller tenacity, great patience combined with deep listening, and excellent probing skills. The seller must play the role of “coach,” in helping the buyer discover what their unspoken—and possibly even unconscious—requirements are to make a decision to buy something similar to what you offer. Many sellers, when they first engage in a new buying opportunity, concern themselves with who their key competition is, and where they stand against it. Sellers shouldn’t waste their time worrying about that. I will tell you right now who the seller’s single biggest competitor is and will be, at least well over half the time. It is No Decision. 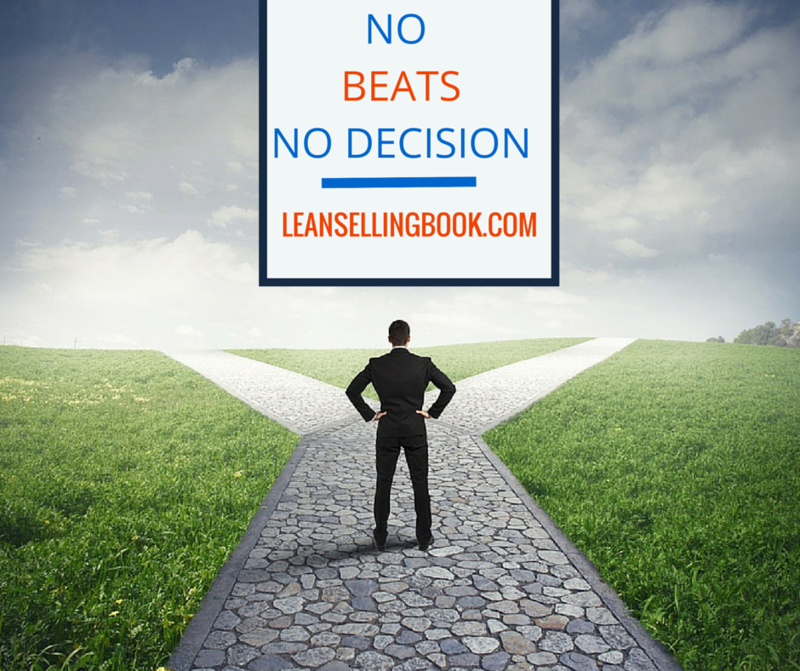 That’s right, the number one competitor is always No Decision or Status Quo (aka, “Do Nothing”). 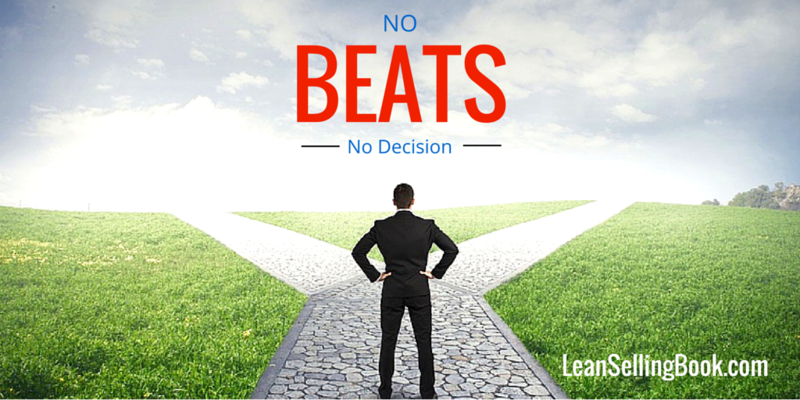 In fact, No Decision is three times more likely to be your competitor than the flesh-and-blood one you know about. It is just good common sense and a wise allocation of a seller’s valuable time and effort to flush out and either conquer or retreat from their biggest competitor, as soon as humanly possible. This is not just an exercise in assessing the odds of winning a deal. It is rather an investment in learning, as quickly as possible, whether you can change the odds of winning a deal. The good news is that if you are able to affect a buying decision, your chance of being the selected vendor at the end of the buying process is about 50%. Those are pretty good odds in my book. It means that if you can double the number of times buyers who engage with you make a decision, statistics say you can double your sales. How much more prospecting would you have to do to get twice as many buyers in your sales pipeline? How much time and effort would that take? Is it even possible? Those of you who follow what I write about sales know that it is always in the context of Lean Selling. You may be wondering, “How does this article apply to Lean Selling?” The answer is: it goes to the heart of a buyer making a decision, which, as we can now see, largely determines the productivity of your selling process. When Lean Thinking is applied to improve processes, including sales, it first measures them. It sets targets for improvement in key process metrics that drive Key Performance Indicators (KPIs) for the company’s sales process. One of the biggest and most costly disappointments in the average sales process is the high percentage of buyers (as high as 70%) who enter the buying process and never buy anything—from anyone—by the end of the process. This means that well over half the time, all the intellectual capital, emotional energy, and financial expense a seller invests in a buyer turns into waste. Can you imagine if you were in charge of a factory that was building some kind of widget, and 70% of your widgets fell off the line before they reached the end? How secure would your job be? Suppose your company provided a service that was delivered to paying customers only about a third of the time. Would that company survive? Yet, we tolerate these kinds of performance numbers in the average sales process. Possibly this is because few companies have taken the time to calculate the real cost of the wasted investment this low productivity rate implies. One of the by-products of lean processes is the elimination and reduction of waste, in all forms. By following the guidance that Lean Selling concepts provide, you can increase the productivity and speed of your selling process while simultaneously reducing waste. In addition, by identifying early-on the obstacles that could get in the way of a buying decision, you will have the opportunity to change the odds of closing a sale. By doing so, you will greatly increase your sales successes without having to find additional prospects, and without having to outsmart or outsell your competition. Except for one: No Decision. To keep this lean conversation going, consider joining the Lean Selling Group on LinkedIn.